Homeless (Luke 9:58), separated from blood relatives (Luke 14:26), no going back (Luke 14:33)……..defining qualities of a disciple? These qualifications for disciples aren’t exactly what you’ll find in an inspirational self-help book, much less a detail to encourage while trying to attract people. No self-respecting evangelist would add “hate you parents and live on the street” to their faith pitch! What in His own name is Jesus thinking?! Well, let’s look at what He’s actually saying. Luke 9:57-58 transcribes an encounter one potential follower has with Jesus. The man approaches Jesus and volunteers his faithfulness. Jesus responds; “Foxes have holes, birds of the air have nests, but the Son of Man has nowhere to lay His head.” Jesus’s response is essentially asking, “Are you sure? This is what you’re asking for.” Aspiring religious leaders of the day would volunteer their loyalty to an established priest in hopes of developing that relationship into an apprenticeship. Jesus doesn’t want students who want to become Him, He wants disciples who will become themselves through Him. As the passage continues, two more similar encounters occur in verses 59-62. During each of these transactions, the potential disciple hesitates, citing a family issue. One wants to go home and bury their father, the other asks to give proper goodbyes to their family members. Sounds innocent enough, right? Possibly, but their lack of commitment to the Mission throw up big red flags. What are these guys really asking? The man who wants to bury his father. Well, there’s no indication how close his father is to the grave. The eldest son is heir to the family fortune in this culture. What the man is most likely asking is, can I go home until my father dies and I receive my inheritance, then commit to following you? Takes on a different tone than just “can’t I bury my dad”, doesn’t it? What about the other guy, he just wants to say goodbye to everyone. Family is important, they are the people who are responsible for forming our character starting at day one. Family also holds the most influence over our decisions. Jesus’s issue is not with the man wanting to tell his family goodbye, the issue is using his family to confirm or change his decision. Jesus wants commitment; now, not after you’ve had time to think it over. Do or do not. There is no try. What is completely evident is that the people who made a total commitment to following Jesus changed their world so significantly they are still affecting ours. Commitment to God so strong you freely ignore when even your closest blood relatives reject your decision. Faith so fulfilling that no possession, even what most deem a ‘basic need’, has space to occupy. Loyalty without regret. Those characteristics make a disciple of Christ that will change their community. Assemble a team of those disciples and they will transform the world. What does this mean for you? Once you’re brave enough to let these qualifications sink in, the will challenge how you understand your faith by posing several questions. Do you believe this book? A negative answer puts you out of the running already. Correctly address these four questions in your faith and you will transform your world, then together we’ll mould the sphere we share. 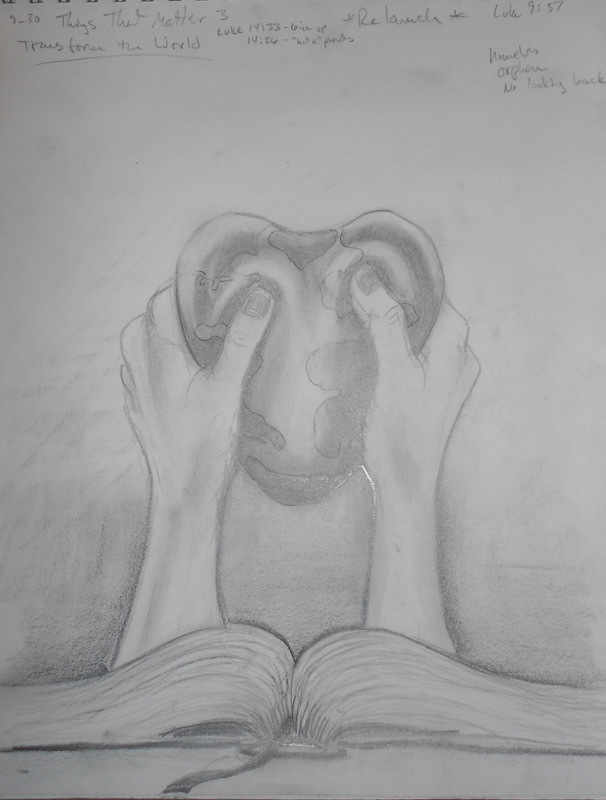 Today’s drawing is two hands, reaching through the Word and taking hold of the world. By committing to the mission taught in the book and exemplified on the cross, the hands mould the sphere into a heart, teaching love through love; transforming the world.